If you can find a better overall high school track and field meet this weekend in the United States, please let us know. But all jokes aside the UK High School Invite is expected to be another barn burner with a bevy of top rated performers with the marks to match. Guess what? More is to come and by the time the evening sets in on Saturday evening, the leaderboards will have erupted. - You can pick your poison here with four of the top ten hurdlers in the country. Andre Turay has mostly run the 55 HH version competing in the Virginia and Maryland. His only loss was to the national leader Kurt Powdar. Even more impressive is Turay ran on two national record relays earlier this season- 4x200 (1:25.60) and 4x400 (3:12.55) at The VA Showcase. Great starts and speed are a must as well as a championship pedigree. Turay will have his hands full with Josh Brockman coming in undefeated. One of his major victories coming into the fray was the VA Showcase 55HH title. Turay and Brockman did not compete at the Showcase. Two other greats are DeAnthony Coleman and Myles Marshall will add some major depth to the field provided they will make the final. -This field is crowded with over a dozen entrants listed with times under 7.00. The main man, of course, is Marcellus Moore who has faced minimal resistance on the mainland this season. The junior superstar in the making has competed almost flawless each time out. Moore's personal best was achieved at the Reykjavik International Games in Iceland several weekends ago. He won going away once again but it's the block start that is a work in progress. If that ever gets fixed, watch out 6.6-low territory. Moore will face local favorite Langston Jackson whose 6.79 has kept him undefeated up to this point. Jackson is the Bluegrass state's top speedster and he finished 5th last year behind Moore's runner up spot. The speedy Nick Cross is here as is the 400m leader Justin Robinson. Robinson ran 46.77 on a standard banked oval in January. He has not officially run a short dash race but has clocked a solid 100m in 10.60 last year. Nick Cross may be the may in the middle that everyone has forgotten. Don't do that! -Last indoor season was supposed to be the time that Kennedy Lightner steps to the front and shine brightly. Several injuries put a damper on things and he struggled to gain the momentum that he built in 2018. Lightner appears to be on the mend dropping a new personal best indoor time at his state meet. He and fellow southeasterner Josiah Taylor will do battle. Taylor has emerged from nobody to something to watch, improving almost three seconds in one school season. Georgian Robert Jarrod Williams is the other sub-48 entrant who ran 47.99 last summer. He competed at the Music City Invite last weekend in Nashville and placed 7th. The mighty Bullis program has three entrants who ran in the 48s. It would be a treat to watch this program export their fine talent in Jay Pendarvis, Ryan Willie, and Sydney Peal. -This could be the "spotlight" race of the entire meet. That was said back in mid-January at the U of Arkansas HS Invite which turned out to be a giant dud. Cameron Miller technically won the battle against Moore with a blazing meet record in the prelim. Moore was in the same heat as Miller but eased up with a smile 50m from the finish line to take third. Neither athlete ran the final. This time it's for the gold medal and supreme bragging rights are on the line... and there is no prelim. If all goes as planned we may see our first sub-21-second clocking of the season. But if there is another stalemate look for Lightner or Robinson to come in and swoop the title. Moore will occupy the far outside lane 6 which means he will not see any opponent. His foes are used to seeing his back in races so this is not a big deal. -We might not see a US leader which is 25-feet, but there is room for a 24-footer like Christian Lewis. He is a local kid who placed 9th last year. One thing is for certain, on his worst day he will jump further than 22-feet. The highly charged Yariel Soto of Centerville OH has a personal best 24-2 from outdoor. The future decathlete has signed with the University of Tennessee. -Things are on the up for Shepler who cleared his all-time best indoors or outside just several weeks ago. His mark is about a foot better than the next competitor. But if there is a challenger out there, count all around talent Soto in. He has faced Shepler before. It should be a fun one. -Last year Carter Cheeseman emerged on the scene by winning the Texas Distance Classic in a fine 14:36. He would later go on to have success in cross country by earning All-American honors at the Footlocker Nationals. Now, the University of Notre Dame signee has inched his way up north to sharpen his middle-distance skills. Cheeseman has run a slick 4:12.85 thus far on the season. We will see if he can improve on the Millrose Games performance. Challenger Sam Gilman of South Carolina took third here last year running 4:13.89. Unfortunately, that was Gilman's signature performance of the season. Let's hope that a better springboard will occur. -It was a big indoor personal best for Aman Thornton who won the Spire Invite last weekend in come from behind fashion. He will look to extend his winning streak against Miguel Parrilla whose lifetime best came just a week ago at the Music City Invite. Another contender to watch for is Sam Gilman. It would be a tough double for Gilman who would be coming off of the mile earlier in the meet. Overall, the field is stacked full of talented guys who have clocked 1:56 or better. -there are 30 entrants in the field but Austin Mathews is the creme of the crop. His seed time was achieved at last year's Eastern Relays and it's the only mark under 9:20. Plus, his 4:16 mile and 14:59 5k on the track is an undeniable attribute. -It really depends on how hard the best team in history indoor wise goes. Bullis knows if they break their official national record it won't count because the track is oversized. But there are a few things to consider though. There are some stacked club teams ready to pounce and try and notch a bullet in their belt. Bullis may actually show up with a split team ready to thwart any challenger. The guess here it will be a 3:17-20 effort and gas the bus up for home. -It should be a great one in the final between Laurencin and Jones. Laurencin has emerged from winning her age group 100HH during last summer's AAU Nationals. Keep in mind that she is from that elite track and field factory Motor City Track Club. Jones, on the other hand, is well established and talented all-around athlete. Her personal best of 8.16 is absolutely smoking. Jones is more than ready to win this title and head back to the peach state. - Killebrew is one of the elite talents is just an eyelash off of the national lead which is 7.31. Last year's winner Grace Stark of White Lake, Michigan ran 7.41 and she will not return to defend her title. The fieldhouse record is 7.26. It could fall but a Hulk effort by Killebrew may be in the cards. -9 of the 15 entrants of section 1 have broken 5:00. The top seed is Madison Trippett and she is coming off of a personal best performance at the Spire Institute Invite. In that tough race, Trippett placed second in 4:53.73. She may be ready to go under 4:50 with the correct setup. NXN All-American Sasha Neglia of Tennessee ran 4:49.10 last year. She is on track to match that after running 4:55 recently. Another name to peep is Sam Bush of Cincy OH. She will be making her season debut after closing out 2018 with a 4:50 personal best. -Hall may an advantage coming in and competing at some top-notch meets. But guess what? The two-time defending champion Dajour Miles is back one more time. The West Aurora senior has signed with UK so she will look to put on another show for her future fandom. "Cinnamon" comes in with a few question marks since she is in basketball season. But two years ago it was the same situation and she dropped a US #2 54.25. We will just have to wait and see if any surprises arise this time. Starcher has decided to take a rest from her main event (the mile) where is US#3 and work on some faster action. In her only attempt this season, Starcher ran 2:10.39. But her lifetime best is 2:07.42 from last year at NBNO to earn All-American honors. The field is solid overall with all 14 entrants coming in under 2:15. -Expect to see Killebrew cash an easy money check and head back to Indy with a smile on her face. Those who may still around when the dust settles should be Jasmine Jones, Shaniya Hall, and Ameia Wilson. -One of the young stars of this sport is at it again. The "dual threat" Taylor Ewert has already made some major noise. Ewert smashed the national 3000m race walk record earlier this season at the VA Showcase. Then later did the same to the mile racewalk. This time she will look to move up the charts in a more traditional race. 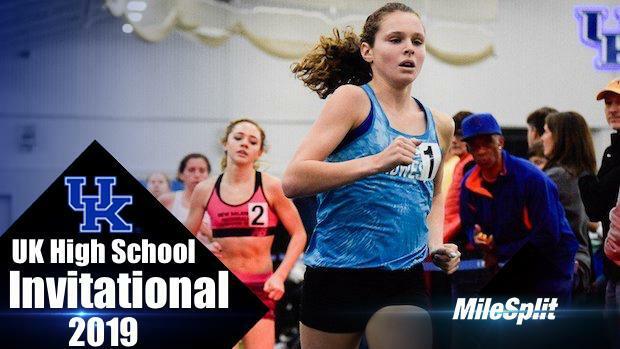 Look for a super effort from Ewert who ran at the Millrose Games Mile last weekend. -Don't be fooled by one just one nationally ranked entrant. Lauryn Harris is going to face some stiff competition. Two girls from the state of Illinois will be waiting in the wings. Ameia WIlson of Danville has cleared 20-feet twice outdoors. If Wilson can get on the board, she will be very tough to beat. Another name is Raelyn Roberson of Glenbrook South. She placed second in states a year ago. So far during the undercover season, she has jumped over 19-feet in several different locales. -Hunt has enjoyed an undefeated season thus far with minimal resistance. That may change on Saturday as the competition is expected to stiffen up. Kennedy Drish of Hamilton Southeastern IN has cleared 12-6 on the season and her best is 12-9. Pole Vault is a timing and rhythm event so the favorite has to be on top of things mentally throughout the event. -Although her label says #2 no high school girl in America has been as dominant as Shelby Tyler. She is the reigning junior national, NBNO, state, and all-around champion. Last year's winner cleared just 5-8. That's going to be topped and the fieldhouse record is 5-11. Bon voyage! -Hopefully, we will see a show out of fast quartet for the showstopper. Shaniya Hall is the main girl for the nation's top squad.